Newbie wonders where the passion has gone in his life. Wait, no. He wonders how people read RandBall. Hint: Very carefully. Newbie? I have always been curious how the randball regulars follow your posts and comments. As I fear change as much as the next guy I have the silly habit of just going to the page and hitting refresh. Which is far more difficult with this new system. Especially considering I found no easy way of toggling between posts. 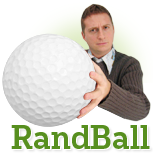 Mr. Randball and others: how do you keep in touch with randball with such frequency? I assume Daveemen just sits on the page all day and hits refresh until he thinks of a comment. Jama spends his day toggling/commenting around various STrib pages. Fasolamatt I know has a finely tuned google reader. Stu, I'm guessing, just has a sixth sense about when a new post comes up and when to place a well timed comment. I have a mac and G1 at my disposal. Please let me know what kind of crazy RSS concoction you have come up with. Preferably one that can utilize the twitters, yammers, facebooks, etcs ... of the world.